Once again the time is quickly drawing near for MSU's annual Theatre and Dance High School Workshop in conjunction with one of our main stage fall productions. This year, the event will take place on October 25, 2018 with afternoon workshops and a 7:30 p.m. curtain for the non-professional premier of Amélie: A New Musical in Craig Hall's Coger Theatre. The cost of the workshop, including show ticket, is $8 per student. Even if the student is unable to attend the performance, the cost remains the same for any participation in this event. Reservations will be made on a first-come, first-served basis and without your check or purchase order, places cannot be held for you and your students. Schools wishing to attend the performance, but not the workshop, should contact the department directly for ticket pricing and group discount information. Runtime is approximately 2 hours 5 minutes, including intermission. We invite your students to participate fully in workshops and see the performance of Amélie, so that they might take away not only a greater appreciation of this work of art, but of theatre in general. Also, check out the Amélie Study Guide. Register as soon as possible. Show tickets are expected to sell out. Please discuss appropriate conduct during the workshops and audience etiquette during the performance. Students can be unloaded on Grand Street in front (south) of Craig Hall. Buses may park in MSU Lot# 44, located to the north of Grand and on the north side of Elm Street. Please contact Cathy McFall at 417-836-5268 or Dr. Carol Maples at 417-836-6389 with any questions. Should you need to contact the theatre and dance department office while you are here, the campus extension from a courtesy phone is 6-4400. The office is located in Craig Hall, Room 355. Please register and pay fee by October 23, 2018. Auditioning for the Theatre: This will be a fun presentation of DOs and sometimes more importantly, DON'Ts of auditioning for a show or university program (acting and musical auditions). Backstage with Amélie: Take a backstage tour for a window into where and how the set was designed and built for Amélie. Dance-Amélie Choreography: Participants should come dressed comfortably to learn choreography from the show Amélie. COMFORTABLE CLOTHING REQUIRED! Costume Design: Presentation of costume design process for Amélie, including research, construction, and actual costumes from the production. Improvisation: True improv actually has rules to help you meet this fun but challenging art. Learn to free up body and mind to live in the moment on stage. 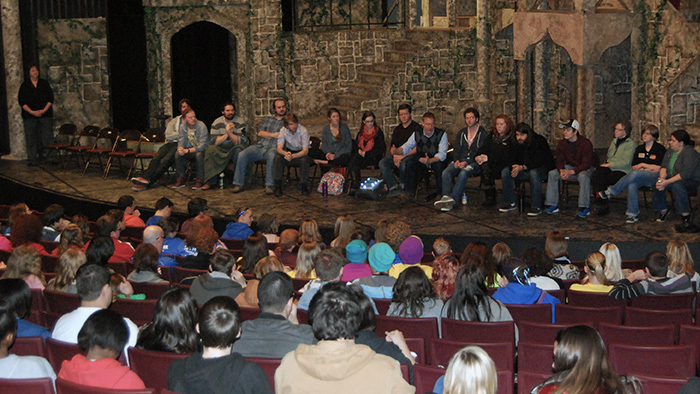 Life as a College Theatre Major: Current theatre majors, including cast members from Amélie, will discuss and take questions on what it is like in college, especially majoring in theatre. Lighting Design: Learn how lighting helps tell the story without words. Also, gain an understanding of how distribution makes light more than color and fade counts. Makeup Design: Demonstration of makeup basics plus specialties such as old age. Makeup Injuries: Demonstration of injury makeup. Volunteers should expect "cuts" and "bruises." MEEP: This is a fun movement and ensemble collaboration workshop led by MSU Artist-in-Residence Actor Ed Swidey, based on his play of the same name. One single word…"meep"…is the means for all communication as students explore how to communicate creatively and effectively using their whole body. Singing for the Actor: A discussion regarding the challenges of acting while singing. Sound-Be Heard and Understood: The number one complaint of theatre audiences is not hearing or understanding the actors. Learn the basics of good sound design, including mic mounting. Teacher Talk: This will be an informal discussion of issues involving theatre in the secondary schools. Theatre Games: Stanislavsky said to "create your own method." Learn some fun and informative tools to help you create. West African Dance Forms: This master class, with Artist-in-Residence Azaria Hogans will explore the Kpanlogo dance from Ghana. Literally meaning enjoyment, experience this amazing workout and "happy dance."